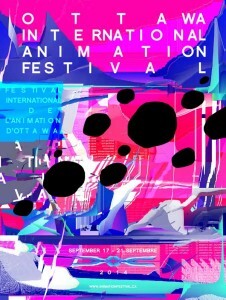 OTTAWA (July 4, 2014) – The Ottawa International Animation Festival (OIAF) is pleased to announce the selection of films competing in the Feature Film Category at this year’s Festival running September 17-21. Two animated documentaries highlight the competition: Seth’s Dominion (Luc Chamberland, Canada) and Truth Has Fallen (Sheila Sofian, USA). NFB produced Seth’s Dominion is a nostalgic and inspiring look at the life of cartoonist Seth. Truth has Fallen uses both live action and animation to tell the story of three people wrongly accused of murder. Tante Hilda (Aunt Hilda) (Jacques-Remy Girerd & Benoît Chieux, France) is a complex, challenging, yet fun film geared to both adults and kids. For those who like surreal, dark musicals animated with fruit, we have Lisa Limone ja Maroc Orange: tormakas armulugu (Lisa Limone and Maroc Orange: a Rapid Love Story) (Mait Laas, Estonia). Rounding out the selections is Até que a Sbórnia nos separe (Until Sbornia do us part) (Otto Guerra & Ennio Torresan Jr., Brazil). Based on the long running musical Tangos & Tragedies, the film examines corporate dominance and environmental issues through the story of Sbornia, an eccentric and poetic country which is introduced to the modern world when a wall collapses. This entry was posted on Monday, July 7th, 2014 at 4:57 pm	and is filed under News. You can follow any responses to this entry through the RSS 2.0 feed.